By now, Microsoft’s release of the Windows 8 Release Preview earlier this year is old news. Microsoft has been keeping interest high in the upcoming Windows 8 official release through its launch of its Surface tablet, as well as a myriad of apps developed for use on Windows 8’s Metro interface. Whether you plan on getting the Surface, making use of Windows 8 on a touch screen PC monitor, or installing it on a tablet you already own, you’ll want to get a head-start on learning some of the most important touch commands that’ll make your Windows 8 navigation experience as simple as possible. Here are some important touch commands to commit to memory before Windows 8’s expected release this coming October. Microsoft seems to be taking a page out of Apple’s book with its multi-touch commands. Much like learning how to navigate the iPad, or even a Mac trackpad, Windows 8 touch commands take time to learn. Once you commit them to memory though, your browsing experience will improve markedly. The Windows 8 touch commands can be broken down by the number of fingers you need to use in order to achieve an action, as well as by specific functions. Commands that use just one finger are the simplest and most intuitive of the Windows 8 touch commands. They essentially just allow you to shift content from one place to another on your screen. If you’ve ever used an e-reader, some of these commands will already be familiar to you. Scrolling through content – just slide one finger up or down to browse content that’s outside the range of your tablet’s screen. Speedier scrolling – to scroll more quickly, just flick one finger in the direction you want to end up. Moving forward and backward through apps – slide your thumb to the right or left. While one finger lets you navigate content and apps, two fingers will allow you to actually manage your various Windows 8 Metro apps. 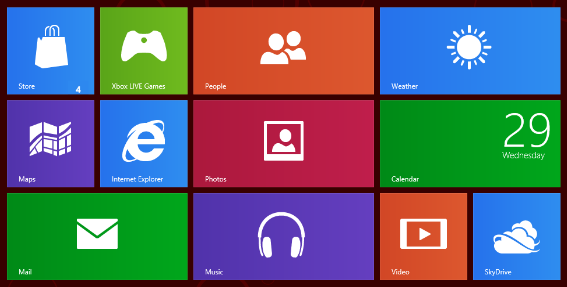 Reveal Windows 8 Charms menu – slide two fingers to the right to the left side of your screen to display essential Windows 8 features like Devices, Search, Settings, and Share. Switch between open apps – by sliding two fingers to the right, on the other hand, you can flip through apps you currently have open. View two apps side by side – perform the same slide to the right as above, just more slowly. Show app commands – just slide two fingers forward and backward through the app interface to see internal app settings. Of all the Windows 8 touch commands, the three finger commands make possibly the least amount of sense. They relate to zoom. The Windows 8 zoom commands are simple to learn, just probably not intuitive without instruction. Zoom in – slide three fingers forward (up). Zoom out – slide three fingers backward (down). Launching apps – tap once on the app icon. Obtain object properties – tap and hold on the object in question. There you go! These touch commands should get you started in anticipation of the official Windows 8 release later this year. Does it seem pretty intuitive, or do you think Microsoft’s over-complicating things?